The Vancouver Condo Buzz » From $99,900! Most Affordable Abbotsford Real Estate Now Selling at Hudson’s Lofts in Abbotsford Central Park Village > 9 to 18 Foot Ceilings at Abbotsford Hudsons Lofts! « From $699,900! Boutique Vancouver GRANT Townhomes on The Drive by Wesbild & Kelly Deck Design > Affordable Luxury Grant Vancouver Townhouses > Only 7 Available! 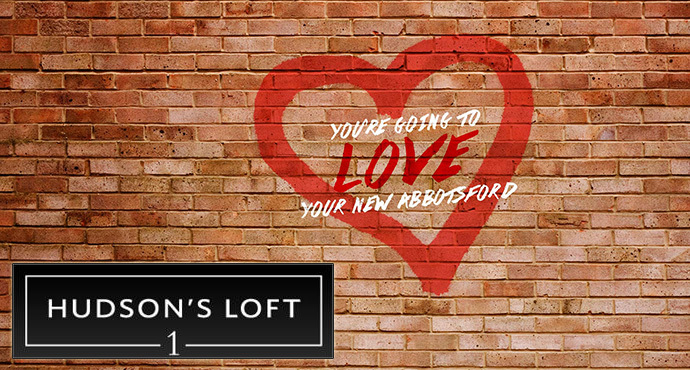 When we say ‘Abbotsford loft’, we really mean an ‘Abbotsford loft’! Introducing single and double level lofts and condos at the Hudson’s Loft development where you will find homes with up to 18 foot over height ceilings! Huge patios and roof decks (some up to five hundred square feet) will be impressive features at the soon to be released Abbotsford Hudson’s Loft apartments. Check out the two show homes at 3068 Gladwin Road Abbotsford as the Hudson’s Loft Abbotsford presentation centre is now open noon to 5pm daily and closed Fridays. You’re going to love your new Abbotsford with an ever changing array of new retail, business, boutique stores, big box retailers and dining options. Add to it recreational opportunities, educational facilities and international airport and close proximity to the Fraser Valley and the US Border, and the new Abbotsford Hudson’s Loft apartments and condos is a great place to call home. Best of all, the new Hudson’s Lofts in Abbotsford real estate market start from just $99,900! 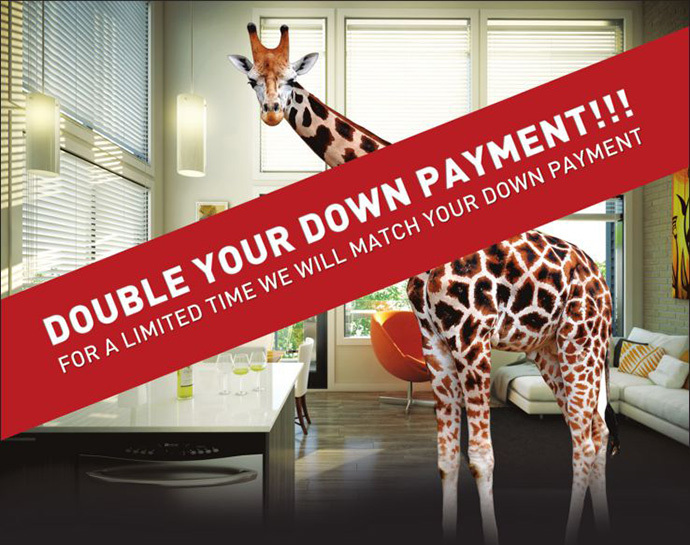 Double Your Down Payment at Hudson’s Lofts in Abbotsford! For a limited time, Hudson’s Loft apartments will match your down payment so that you can double up your downpayment when it counts most! You only need 5% down payment and you can pay that over 24 months! The new Abbotsford Hudson’s Loft apartments for sale are now here and won’t last long with starting prices from just $99,900! At Hudson’s Loft, your five per cent deposit can be paid monthly (starting at just $200 per month). And to make ownership even easier, the developer is matching your deposit (for a limited time offer only … please see sales staff for all the details right now!). This is an incredible offer and there is nothing that compares to it! THE CATCH? With only 67 presales homes available for sale and a lot of interest for the double your down payment offer, it’s first come first serve! So get down to the Hudson’s Loft Abbotsford condo sales centre today and get all the information right now! The presentation centre is located at 3068 Gladwin Road Abbotsford and you can also visit the web site at www.hudsonsloft.ca. Call or visit the sales office for more information. Where else can you buy a new condo with lofts and ceilings so high you can play indoor basketball, fly a kite or own a pet giraffe… and you don’t need a down payment up front! These are the new Abbotsford Hudson’s Loft condos for sale right now! Hudsons Lofts are brought to you by the Wiebe Group developers and the sales office is now open Saturday through Thursday between noon and 5pm (closed Fridays). Ceiling heights are between 9 to 18 feet and the starting pre-sale pricing is from $99,900. This special payment plan allows first time homebuyers to purchase their new home for $200! Qualified buyers can pay $200 per month for 24 months. Plus, the developer will match this for a limited time offer. Buy mid 2015, buyers will have 10 per cent down. The developers of the Hudson’s Lofts in Abbotsford include Wiebe Group and Diverse Properties. An established neighbourhood offering brand new loft and apartment residences is now here! Introducing the Hudson’s Lofts in Abbotsford’s Central Park Village neighbourhood where you will find a natural setting with a distinct community feel. Catering to downtown lifestyle but having the pricing flexibility and friendliness of a small community, the new Abbotsford Hudson’s Lofts and Apartments provide home buyers a unique opportunity to live within a great city but far away from all the noise and busy streets. The Hudson’s Lofts are part of the master planned Abbotsford Central Park Village neighbourhood where you can find close proximity to local transit routes, public transportation, schools, amenities, local services, shopping and dining options. The Hudson’s Lofts in Abbotsford is the first residential development in Central Park Village Abbotsford real estate development which means that you can own in a ground level opportunity right now! This 9.5 acre neighbourhood will be the eventual home of a village market and café, restaurants, local businesses/commercial space and lots more. In addition, the development is next to the beautiful and untouched forest trails in Horn Creek Park Abbotsford as well as many parks and public spaces for you to enjoy year round. The Central Park Village Abbotsford master planned neighbourhood is also close to big box retailers such as The Real Canadian Superstore, Seven Oaks Shopping Centre and West Oaks Shopping Mall which are less than 10 minutes walking distance away. In addition, the Abbotsford Entertainment and Sports Centre, Abbotsford Art Gallery, Tradex Centre and movie theatres are nearby. The new Abbotsford Hudsons Lofts and apartments are also very close to the West Coast Express and is a forty five minute drive to downtown Vancouver via the Port Mann Bridge. Contemporary finishes and features are the keys to the modern Abbotsford loft residences in Central Park Village. Ranging between $99,900 to $269,900 with special down payment offer for a limited time, the new Abbotsford Hudson’s Loft residences will feature garden terrace condos, apartment flats on the 2nd floor and lofts on the 3rd and 4th floors. The 2 level Abbotsford penthouse apartments at the Hudson’s Lofts are situated on the top 2 floors and feature rooftop decks as per plan. The progressive living spaces are open concept and truly functional. There are 2 colour palettes that include: Madison and Soho. The ceiling heights for the one level apartments are approximately 9 feet whilst some of the Hudson’s Lofts have heights up to 18 feet! Large windows and spacious balconies are amazing. Inside, you can enjoy engineered wood floors in the living spaces and carpet in the bedrooms. Every home comes standard with energy efficient kitchen appliances by Frigidaire (or equivalent) including an over the range microwave/hood fan, ceramic glass cooktop, and undermount sink. The kitchens also have soft close hardware and high quality cabinetry in addition to engineered quartz counters. Some of the floor plans have efficient stacking sliding glass den wall systems and all homes have stacked Energy Star rated washer and dryer in addition to water efficient Kohler toilets. The bathrooms at the new Abbotsford Hudson’s Lofts and apartments have marble counters, marble accent tilework, modern faucets, rain showerheads and deep soaker tubs.